1. “Then the Lord spoke to Job out of the storm: ….‘Can you pull in the leviathan with a fishhook or tie down his tongue with a rope? Can you put a cord through his nose or pierce his jaw with a hook? Will he keep begging you for mercy? Will he speak to you with gentle words? Will he make an agreement with you for you to take him as your slave for life? Can you make a pet of him like a bird or put him on a leash for your girls? Will traders barter for him? Will they divide him up among the merchants? Can you fill his hide with harpoons or his head with fishing spears? If you lay a hand on him, you will remember the struggle and never do it again! Any hope of subduing him is false; the mere sight of him is overpowering. No one is fierce enough to rouse him. Who then is able to stand against me? Who has a claim against me that I must pay? Everything under heaven belongs to me,’” Job 40:6, Job 41:1-11. The Lord concludes this long imagery of Satan saying, “Nothing on earth is his equal- a creature without fear. He looks down on all that are haughty; he is king over all that are proud,” Job 41:33-34. Satan is God’s enemy yet God did not assign us to rule over him. Otherwise we would be contradicting scriptures like the one being discussed from the book of Job. In this life we remain “a little lower than the angels,” Hebrews 2:7. This includes fallen angels. My book Breaking Curses, Including Generational Curses has more info on the work of angels (see the book’s Chapter 6 “The Nature of Angels: God’s Angels and Fallen Angels”). God is in control of everything, including over Satan. He’s the one who created Satan as his angel. When Satan chose to rebel it did not reduce God’s power over him. Satan does not have any claim over any matter even over areas he would appropriately claim legal grounds. If God denies him there’s nothing Satan can do about it. God will completely slay Leviathan on Judgment day. “In that day, the Lord will punish with his sword, his fierce, great and powerful sword, Leviathan the gliding serpent, Leviathan the coiling serpent; he will slay the monster of the sea,” Isaiah 27:1. Our realm of authority assigns us to deal indirectly with Leviathan. We see this in the way Christ exercised his authority and dealt against the works of Leviathan in people. He preached the gospel that made the deception and false beliefs in people to be cast out by the truth. The only exception is when casting out or expelling evil spirits living in people. Here we have the authority to speak directly to them and command them to come out of people. This is the realm of authority where our Lord said, “I have given you authority to trample on snakes and scorpions and to overcome all the power of the enemy; nothing will harm you,” Luke 10:19. Notice that Jesus said these words soon after the seventy-two disciples “returned with joy and said, ‘Lord, even the demons submit to us in your name,’” (v.17). He then replied to them, “I saw Satan fall like lightning from heaven,” (v.18). He said the famous words when they returned from casting out evil spirits living in people. The context of authority constituted their work of casting out evil spirits living in people. Outside this context we are merely giving ourselves authority over the enemy that we were never granted. The consequences are severe as the book of Job says: “If you lay a hand on him, you will remember the struggle and never do it again! Any hope of subduing him is false; the mere sight of him is overpowering. No one is fierce enough to rouse him,” Job 41:8-10. 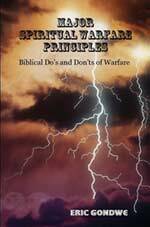 Even our Lord Jesus used indirect principles assigned to us during his time on the earthly realm (when he came in human form). He was made a little lower than the angels and thus had to follow the authority structure. The story changed after his resurrection. He now has full authority over Satan in both the heavenly and earthly realms. “We see Jesus, who was made a little lower than the angels, now crowned with glory and honor because he suffered death, so that by the grace of God he might taste death for everyone…Since the children have flesh and blood, he too shared in their humanity so that by his death he might destroy him who holds the power of death--that is, the devil and free those who all their lives were held in slavery by their fear of death. Hebrews 2:9,14-15. 2. “These dreamers pollute their own bodies, reject authority and slander celestial beings. But even the archangel Michael, when he was disputing with the devil about the body of Moses, did not dare to bring a slanderous accusation against him, but said, “The Lord rebuke you!” Yet these men speak abusively against whatever they do not understand; and what things they do understand by instinct, like unreasoning animals--these are the very things that destroy them,” Jude 1:8-10.